This is a great watch design and dates back to one of Hanhart's earliest productions. 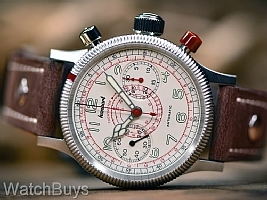 The Hanhart Pioneer TachyTele features in addition to the chronograph functions two practical and highly legible red scales. The first is a tachymeter scale for measuring average speeds and is incorporated in the center of the dial in a spiral formation. This scale allows for a total of three revolutions of the stop indicator hand and considerably extends the measurement range, enabling even relatively slow speeds of 60 km/h down to 20 km/h to be accurately measured. The telemeter scale, which is printed on the peripheral edge of the dial, is used for measuring distances, taking into account the speed of sound. This watch is water resistant to 100 meters and is fitted with a vintage dark brown riveted calf skin strap with tang buckle.